Yesterday Drew had a fever. He also had a cough, was lethargic and didn't want to eat. Under the advice of my husband, we took the little man and the littler man (who was exhibiting similar symptoms) to the Doctor. After waiting in a 7 X 7 foot room with one chair with all of the Bees for over an hour, we saw the Doctor. The test (which involves sticking the world's biggest q-tip up my children's noses, which amounted to lots of tears) was positive almost immediately for Influenza A. I only had to look to my left to my husband to know where they caught it. I am drinking lots of orange juice and water. I am taking my vitamins. I am getting lots of rest. It's okay for the rest of the family to be sick, they don't do the bills, the laundry, the grocery shopping, make dinners. I do. 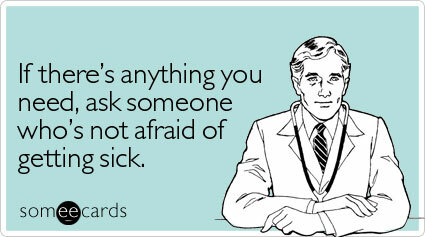 Plus I'm kind of a wimp when it comes to fevers. Not Mr. Bee whiny, but pretty close. It will not be a pretty picture if I get sick. Think healthy thoughts for me, okay? Oh no!!! :( I'm sorry to hear that they're all ailing. Hopefully you stay healthy and happy so that all the bills get paid, dishes get washed, clothes get cleaned, beds get made, food gets cooked....I know, it's a catastrophe when we go down. Stay strong, woman! Maybe you should get you one of those face mask...you can decorate them to match your clothes...I do feel for you that is no fun having sick ones all around you. Hope you get thru this without getting sick!!! Stay well! I had my flu shot last week. Hang in there! I hope you fight this off! This sounds like absolute misery. Try and stay well amidst the germfest! Just Joking!! Hope everyone is healthy now!